The chapter focuses on the multifactory model, its evolution, and a step-by-step guide to building a multifactory. The first part of the chapter will present the reasons that led the authors to the decision to elaborate a model for a co-manufacturing space, the main features that characterize a multifactory, the key points of the multifactory model, and a description of the salient elements that have characterized Bigmagma, the development environment of the multifactory model. The second part presents the result of the evolutionary path of the model, presenting the subdivision into phases and macrophases of the intervention model and describing the first complete experience of application of the multifactory model, R84 Multifactory Mantua. During the first phase of the on-field research, the authors got in contact with shared workspaces that hadn’t been developed following an existing model, a defined path. They were based on assumptions coming from some previous experience of the coordinators or initiators, and almost totally made on a trial and error basis. People belonging to different shared workspaces never met each other and didn’t know anything about other similar projects. So, it was somehow surprising to discover that the shared workspaces faced the same problems and they presented many similarities in structure, organization and governance. Moreover, also the self-perception of people involved in different shared workspaces is very similar, as is the overall ethical point of view. Senge underlines that “personal vision, by itself, is not the key to releasing the energy of the creative process. The key is “creative tension,” the tension between vision and reality. The most effective people are those who can “hold” their vision while remaining committed to seeing current reality clearly.” All the spaces visited during the research tried to reach this balance between the visionary prospect of a future where human and professional relations are based on exchange and sharing and a present where economic operators can apply these principles concretely and at the same time be able to operate in highly competitive markets. The keystone, therefore, lies in the organisational structure, which is the framework capable of making the shared vision of a group of people effective. 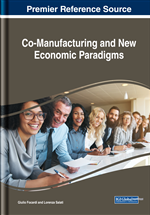 The authors focused on those characteristics that could help to start, run and develop a comanufacturing space, run as a community project and highly heterogeneous in terms of members composition. The authors first defined a Model to describe the structure of a multifactory, taking from the observed shared workspaces the main elements in terms of governance, organization and composition, and then developed and tested the Intervention Model, a step by step guide to help in the construction of a multifactory from scratch and to support its development.